Or Dahlias perhaps... I think this flower I made looks more like a zennia than a dahlia. 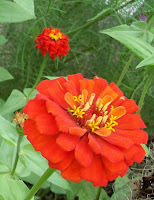 Ever since I started making these paper flowers, I've been iching to try making it in red to look like this. My creation came out more orange than red, but I still like it. I started off with 4 large flower layers of Real Red, 3 large flower layers of Pumpkin Pie (water colored red) and 2 small flowers for a Pumpkin Pie center. Next time I'll do a Summer Sun center with the tips yellow and the inside orange, only 1 large Pumpin Pie flower and the rest red. If you're totally confused...don't worry, I will try to find the blog where thye directions were and post it here. 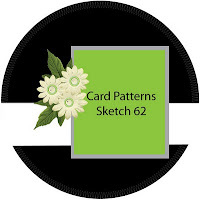 The layout is based on this weeks Sketch Challenge #62 at Card Patterns, if you haven't checked them out, they are a great inspiration! This is fantastic! I just adore your handmade flower!!! Fabulous card and gorgeous flower! Thanks for joining us at Card Patterns! Ooh LOVELY card! I love the colours you've used and that border looks fab!